At first glance, this roasted tomato sauce recipe may not seem like something that's worth the trouble. That is, until you realize it's actually less work, and about the same amount of time as a stove-top version. However, don't make this because of any procedural advantages, make it because it tastes awesome. What the hot oven does to the deep red San Marzano tomatoes is a wonder to behold, and produces a pasta sauce with some serious depth of flavor. After it's post-roast re-hydration, this sauce is ready to rock. This would be amazing for a chicken parmesan or beef pizzaiola, or even more simply showcased, as it is here. 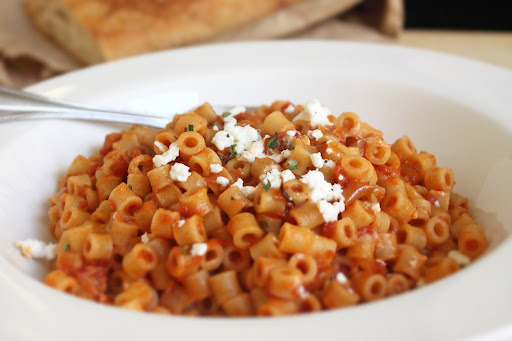 The always entertaining ditalini are a perfect medium for the rich sauce, smoky oregano, and creamy, tangy goat cheese. By the way, this is a great trick when you already have the oven on for roasting some meat or chicken. While your roast is cooking, you can also be making the sauce for your pasta side dish. Also, the sauce will add moisture and aroma to the oven, so it's a win-win. I hope you give this a try soon. Enjoy! looks so delish! i'm a pasta freak, wish i was in that kitchen eatin' some of that pasta! I take it you can jar this and use it in many other sauces that require marinara sauce? 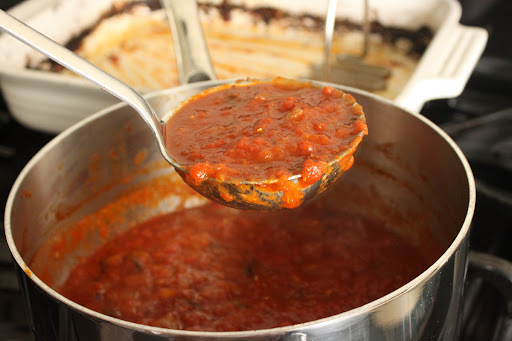 Oven roasted tomato sauce is awesome! I never seem to make enough of it. So I'm going to triple this recipe and roast in batches. Have you been taking voice lessons, Chef? Your annunciation seems sexier than usual. Will you give suggestions for using fresh tomatoes, instead of the canned variety? Just planted some and expect there will be an abundance in the not too distant future. Can you do it the same with fresh basil? Seems like it'd be fine, but there might be some Magical Basil Trauma in an oven that I'm unaware of. I think it would be good for you to have a Goat sound effect, every time you say Goat Cheese. Here is when to add Goat Cheese, "baaaahhhh "
would this sauce freeze well? you said it was a great sauce to make when you were going to have the oven on anyway. we'd like to make it ahead and store it style of thing. you know, for later dishes. My sister had made some tomato pasta meat sauce today, so after seeing this I decided to roast it before putting it on my pasta. WOW, the almost charred feeling was amazing, kinda like.. barbequed pasta sauce if that makes sense haha. Anyway good stuff man! yes a pinch of dry is fine. yes, great on polenta! You are on my Google homepage and everyday anticipate a new video. Thank you. I will be trying this right away! I just have to laugh at the marvelous timing of this posting. I found it right after I put on a small pan of pasta sauce because I was craving pasta and marinara for breakfast. Yes, I can be odd. At any rate I tend to caramelize some tomato paste with my onions and garlic before putting in the tomatoes and herbs. It is to give it a roasted tomato flavor. The technique works fine but I'm now looking forward to this fabulously hands off version. I love the tips I get from your videos. Aaand I'll be looking for San Marzano tomato starts this year. All your fault. How much sauce will this make? Enough to cover one pound of pasta? I have a 106 oz can of San Marzano tomatos that I found at Costco a while back (but have never seen since. I have been wondering how to deal with them. Let the roasting begin! I made this for my family tonight. I have been cooking for my wife for 20 years and she said this was by FAR the best pasta sauce she has even eaten!! I agree. Thanks Chef. And now here you are using them too! If it makes a difference, I'm in Houston, TX. Mmmm looks like an amazing pasta sauce! I was just wondering but what kind of herbs should I grow at home? How much should I grow? You are hilarious! You are my new favorite food blog! *bleep* oregano. Try marjoram. As they say, "Once you've tried marjoram, you won't go back... oram." I HAVE to make this right now! Hey! I love the idea behind this video. Stupid question though - I tried to make this tonight, but when I dumped my can of Cento San Marzano Tomatoes into the pan, I noticed that they are filled with seeds. I watched the video 5 times, and read through all the comments. There is no mention of what we are supposed to do with the seeds. I know that regular tomato sauce recipes have you run the tomatoes through a Foley food mill. But - Chef John's version does not seem to have this step. Am I missing something? Or - do people eat tomato sauce with a ton of seeds in it? Already the smell of the dish in the oven is amazing. Chef John...Another outstanding recipe. I didn't have fresh oregano, so I used fresh flat-leaf parsley and a little fresh basil. I cook many different pasta sauces, (I'm Italian you know), but this one is really, really good and I'm sure I'll be using it a lot. Don't know why people have to parboil and peel the skins seed it etc...I just cut the plum tomatoes into 3 pieces and roast them along with onions+garlic and mashed them once they're done.. Tomatoes already on the oven! Would fontina be a suitable substitute for goat cheese? they are not the same texture, but really any cheese you like would work. Really liking the technique. I'm gonna add some more stuff though (more onion, a bell pepper, MOAR GARLIC etc. ), and dump it over some meatballs and spaghetti. I loved this recipe!! I really enjoyed roasting the tomatoes and I am now thinking of using this technique for a base to all my tomato sauces. Instead of the canned tomatoes, I used tomatoes from my garden that I had previously boiled to remove the skins. The only difference was that I had to roast it longer because of all the excess water from the tomatoes. It was a great way to use an abundance of tomatoes all at once. I made this for Sunday dinner for my husband and 3 of my friends. It was a hit! Thanks for sharing this very easy recipe. does it have to be plum tomatoes? I have San Marzano whole tomatoes, my whole food store did not have plum tomatoes, will the whole tomatoes work just as well? I've been looking for a simple pasta e pomodoro recipe since I left Italy. This one arrived just in time! My very Italian, Tuscan restaurant-owner, full-time chef boyfriend arrives in ten days. Even if he will never admit it (what good son would? ), it's as good as his mama's! Let's see what he says when he gets here. Keeping my very Southern American fingers crossed...and thanking God for you and my fresh herb garden! I don't like the acidic taste in most can/jar tomatoes. Would the sauce taste a bit sour in this recipe? How can I get rid of the acid in the sauce the comes in a jar or a can? I notice the restaurant pasta doesn't have that acidic taste. That's mostly from cheap low quality tomatoes. The nice places (and me) use San Marzano tomatoes. They are very low acid and sweet. Isn't the smoke point of extra virgin olive oil 375 degrees? Won't over an hour at 425 result in a smokey oven? Is that why you said to use high quality olive oil? Not sure about smoke point, but this has never smoked in the oven for me. What if the town you live in doesn't carry San Marzano tomatoes? Can any can of plum tomatoes work here? Chef, I wanted to tell you that I made this again tonight. It really is one of my favorite pasta sauces and the house smells great! Thanks for everything!